The Peace Arch News is reporting that "One man was fatally wounded in a Friday night shooting in Langley Township. 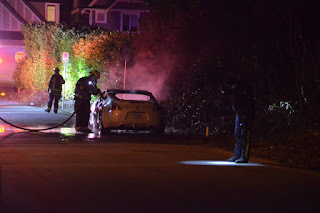 Just after 9 p.m., Langley RCMP received calls of shots fired in the 8200 block of 204B St in a newly developed area of Willoughby. They arrived to find an injured male in a townhouse complex with two gunshot wounds to the chest . Firefighters and paramedics performed CPR on the victim as they were loaded into the ambulance. The regional Integrated Homicide Investigation Team (IHIT) has taken over the investigation. IHIT has confirmed one person is dead and has promised to release more details later today. About the same time, firefighters received calls for a nearby vehicle fire at 206A St. and 84B Ave nearby." Update: Global is reporting that "On Saturday, IHIT identified the victim as 23-year-old Tarek Ali Al-Romeshi of Surrey. Last December, there was a fatal shooting in the area. IHIT identified the victim in that shooting as 21-year-old Dai Duong Duong." The Indo Canadian Voice is reporting that "Duong was known to police and associated to gang activity." The Surrey Now Leader is reporting that Al-Romeshi was not a resident of the complex and he was not known to police.